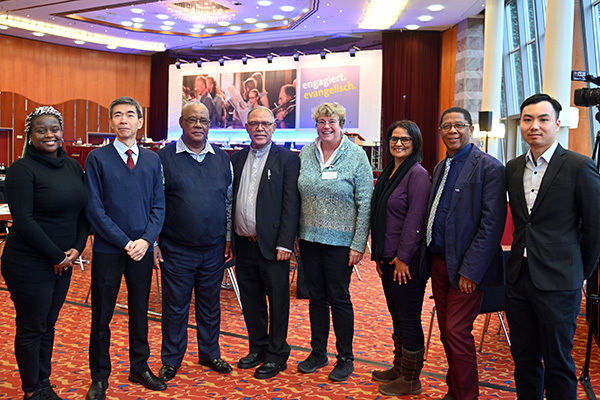 Delegates from the different Rhineland churches: (L-R) Terri Lynn Smith (RCSA), Ka Keung Chan (CRC), Joseph van Houten and Ashley Fransman (RCSA), Executive Minister Barbara Rudolph, Brenda Sass and Tommy Solomons (RCSA) and Kwan Ching Yu (CRC). There is not only a Rhineland or "Rhenish" church in Germany in the form of the Evangelical Church in the Rhineland – it also exists in South Africa as the Rhenish Church in South Africa (RCSA) and in China as the Rhenish Church Synod Hongkong (CRC). Here “Rhenish” comes from “Rhenish Missionary Society”, in German “Rheinische Missionsgesellschaft”, which was founded in 1828 in Mettmann, Germany, and whose work has continued later under the auspices of United Evangelical Mission (UEM). The exhibition “Rhenish in the world” provides information about the history of the Rhineland churches in Hong Kong, South Africa and Germany, as well as about their current work together through the VEM network. President Manfred Rekowski and Julia Besten, director of the Archives and Museum Foundation of the UEM, launched the exhibition during the regional synod 2019 in Bad Neuenahr. "We carry a history in ourselves that is over 190 years long"
The mission work of the Rhenish Missionary Society in China began in 1847 at the suggestion of a non-stipendiary missionary in Hong Kong. Churches and schools were founded in many areas up into the 1940s. Medical care and work with women were further focal points. Today the Rhenish Church Synod Hongkong has shifted its mission from development and aid to supporting other local church congregations, spreading the Christian faith and improving theological education in other countries. The Rhenish Church in South Africa is an independent Protestant church in the Cape Town region. In 1829 four Rhineland missionaries founded various mission stations. Beginning in the 1930s, the Rhenish Missionary Society transferred its local church congregations to the Dutch Reformed Church. Not all of the congregations were in agreement with this development. Some of them declared themselves to be independent churches and the Rhenish Church in South Africa came into being in 1978. Over time the Rhenish Church in South Africa slipped from the notice of the other Rhineland churches. An initial meeting of representatives from all three Rhineland churches and from UEM and the Archives and Museum Foundation of the UEM took place in Germany in 2013. Discussion focused on the churches’ identity with regard to their origins and development over time. A second meeting in 2015 explored the meaning of the Rhenish Missionary Society’s legacy for the current work of the Rhenish Church in South Africa, and it was agreed to reappraise and review the church’s history through a research project. Deeping partnerships, joint projects and the awareness of being part of a global movement as a Rhineland church were central topics of a third meeting in Hong Kong in 2017. There will be a special Ceremony of Remembrance by the Rhineland churches and UEM during the regional synod on Friday, 11 January.